Ready to rethink the melt sandwich? Slather a slice of cinnamon-swirl bread with cheesecake filling, add chopped Oreos and more cheesecake filling, then top with raspberry jam, Nutella, and your top slice. Pan-sear it to a crisp-gooey finish and get ready for the sweetest melt you’ve ever had. Slather outsides of bread with butter. Spread cheesecake filling liberally over unbuttered side of the bread and place coarsely chopped Oreos, generously, on top of filling. 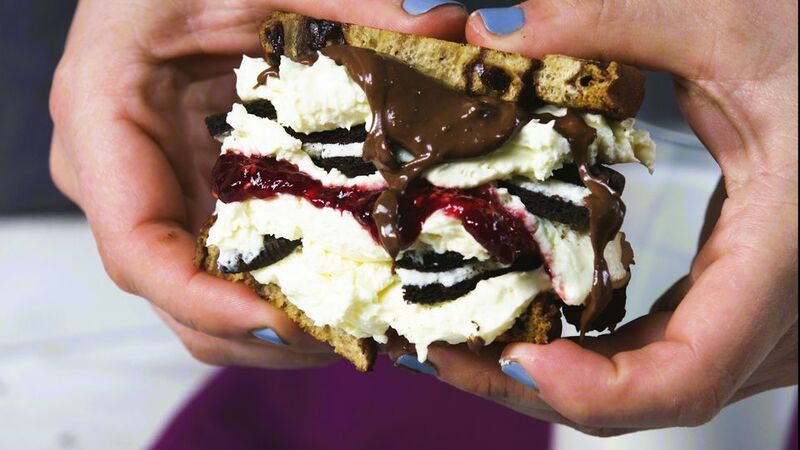 Drizzle raspberry syrup or Nutella over Oreos and cheese mixture, then top with the other slice of bread. Place in griddle and cook until cheese is gooey and bread is crispy. Obsessed with Stranger Things? Enjoy These Eleven Waffle Sandwich Recipes! How Many Sandwiches From Around the World Have You Tried? Here's 15!